it is very important to write about it and invite them to move in tonight. chin to knee on the orchard wall, cooled with dew and cherries eating. What a beautiful way to stir the imagination. I am sure there will be pleasant dreams tonight. Well done. Life indeed is grand, my friend Peaches. Beautiful. What fun! Do you want me to reblog? That’s some digs, Beth. What are the chances you could replicate something like that on a human scale? Ooh – maybe a matter of time? Here is fairy magic courtesy of Beth at ididnthavemyglasseson, home of irony, humor and appreciation of all things kid. Great fairy call by Emily Dickinson. 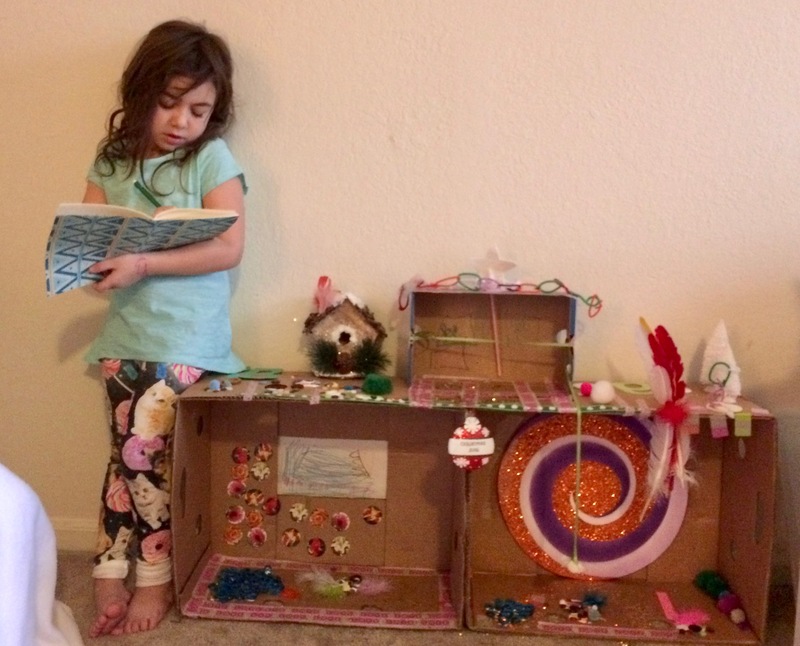 Who can resist an indoor winter fairy village? Lovely idea…I hope some fairies come! Love Emily’s poems, and fairies too! What a lovely vision–‘twould be heavenly to have a fairy village to escape to from time to time. Thanks, Beth. V is a lucky grandie, and you get to play, too! These are some lucky fairies Beth. The fairy village looks beyond inviting. No doubt she’ll have a full house! Magical. The way childhood should be – for little kids and big kids. Your grandies have an AMAZING grandma!